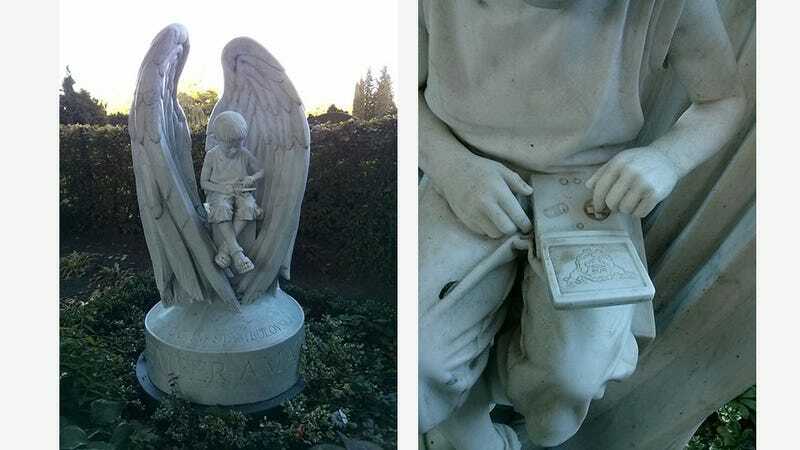 This is, sadly, the tombstone of a five year-old boy, located in a cemetery in Lund, Sweden. A boy who obviously loved his Pokémon so much it's become a big part of his memorial. Peek over his shoulder and you'll see that the artist responsible for the tombstone has depicted him with his Game Boy Advance in his hands, a Pokémon game on the screen. There's even the added touch of carving a Graveler underneath the handheld, holding it up. A sad story, to be sure, but also nice to see that something which was obviously so important to him in his short time on Earth could go with him when he left it.